"A heartbroken girl. A fierce warrior. A hero in the making. The Winterians have lost their people, their conduit, and basically their kingdom to Spring. Only a few survived the fall, and have been searching to get their magic and kingdom back up and running. Meira is among them, as well Mather, the future King and William (Sir) who trains them and helps run whats left of their crew. On their quest to obtain both halves of Winter’s conduit (a locket broken in two) they must battle through friend and foe, and make treacherous consequences, but is obtaining the locket halves really all that has to be done? Could it really seem so easy? Travel through Snow Like Ashes and see what you’ll find through the looking glass. When a new author emerges onto the scene, it’s intriguing. When a new fantasy comes with them, it’s enthralling. When this new author and fantasy together start a new adventure that you just cannot put down, it’s absolutely positively gloooorious! 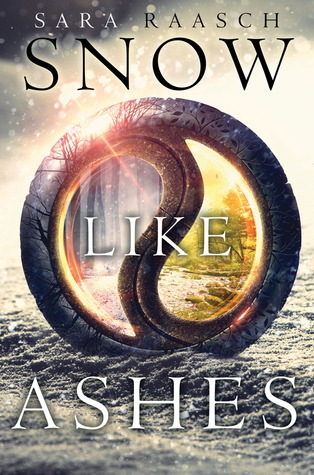 Snow Like Ashes first hooked me from the first time I saw it being unboxed on an Epic Reads ARCParty, and the summary reeled me in with the promise of an original adventure of fantasy and heroism. Let me tell you, this book did not disappoint. This book is chock-full of adventure and thrill, and it doesn’t give way to fluffy filler that are unfortunately the downfall of other first series starters. This book places you among the kingdoms and let’s you roam with Meira. MEIRA!! She’s the main character with a love of duty, honor and family, the last of the Winterians. I love Meira’s strength and complete dedication towards her kingdom’s future and how unselfish she is. Unlike other women in their group, Meira doesn’t want to just sit around, she wants to be an active force in getting her home back into a running kingdom and getting Mather, the only Winterian royal left, on a throne. Unfortunately for her, Meira is in love with Mather and what’s more unfortunate, she may have to give up more than she thought was possible. How can Meira contribute towards obtaining both halves of the Winterian’s locket conduit with just some training and her trusty chakram? Is there more at stake than just getting a hold of a piece of jewelry, or is something more sinister growing amongst the kingdoms? This story is wonderfully written and I love how the reader learns everything along with Meira. I also enjoyed the way readers learned the nation’s history and how it was presented and narrated, which helped with the wonderful world-building that the author depicted. The only drawback I could find with the book is that I saw the plot twist very early on and therefore it was predictable, but the book was so adventurous I wasn’t exceptionally phased by this, as I craved the thrill and the action that drove our team of Winterians around the country. I am a full-fledged Theron fan, but you’ll have to read the book to understand *smirks* In all, I need the next book, Ice Like Fire, like winter needs snow, like Meira needs her chakram! A lot is packed in this one book and you’ll won’t want to put it down. You get a great sense of the different Seasons and Rhythm kingdoms. I love Meira’s strength and complete dedication towards her kingdom’s future and how unselfish she is. I also love how the history is narrated throughout, which helped with the world building. I saw the plot twist with Meira very early on in the book, and it was predictable.